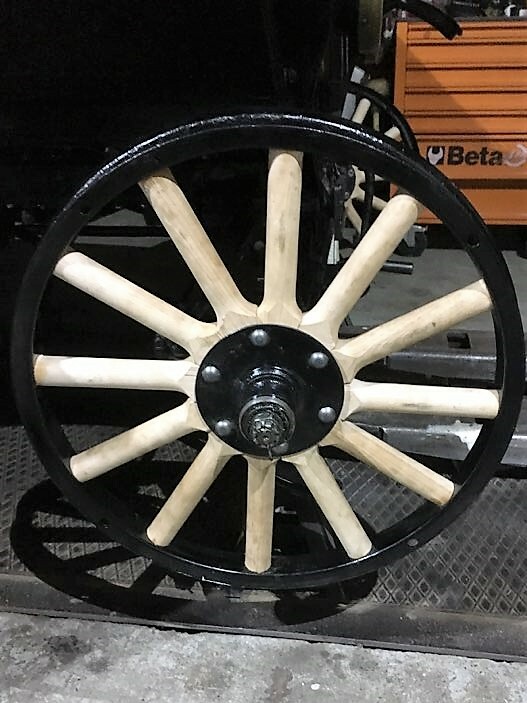 I made my 21" wheel with new spokes. It worked perfect on the rear wheel but not on the front. The outer ring moves more then 1/2 inch sideways. 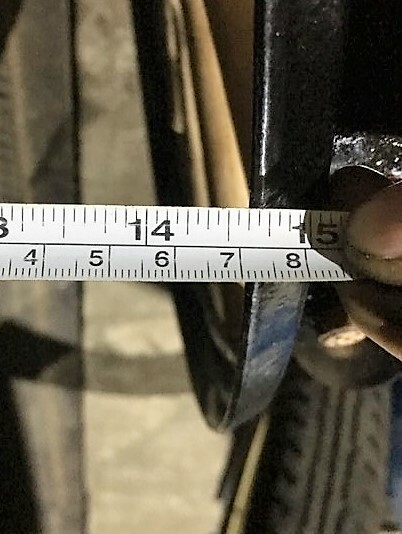 Are you sure that the hub and outer plate are firmly clamping down onto the spoke bases? 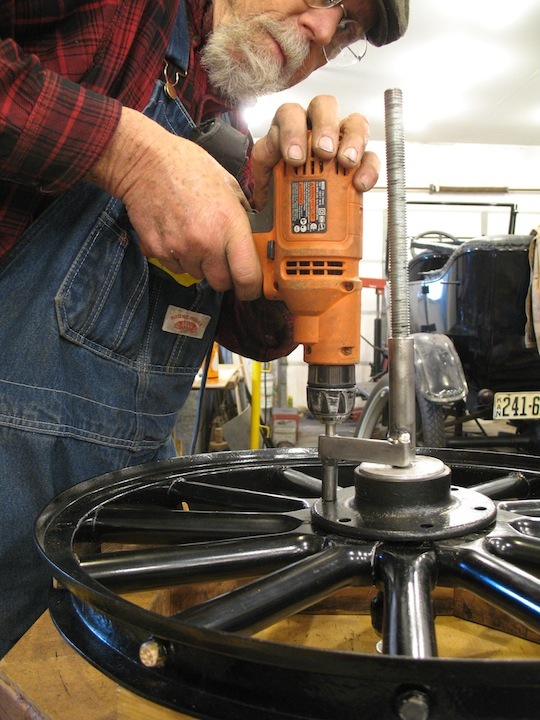 Remove the hub bolts and outer plate and verify that the plate slides down easily onto the spoke bases, i.e. it isn't hanging up on the hub before it touches the spoke bases. file the center hole in the plate as necessary, then fit the plate, install the bolts, and tighten them again. 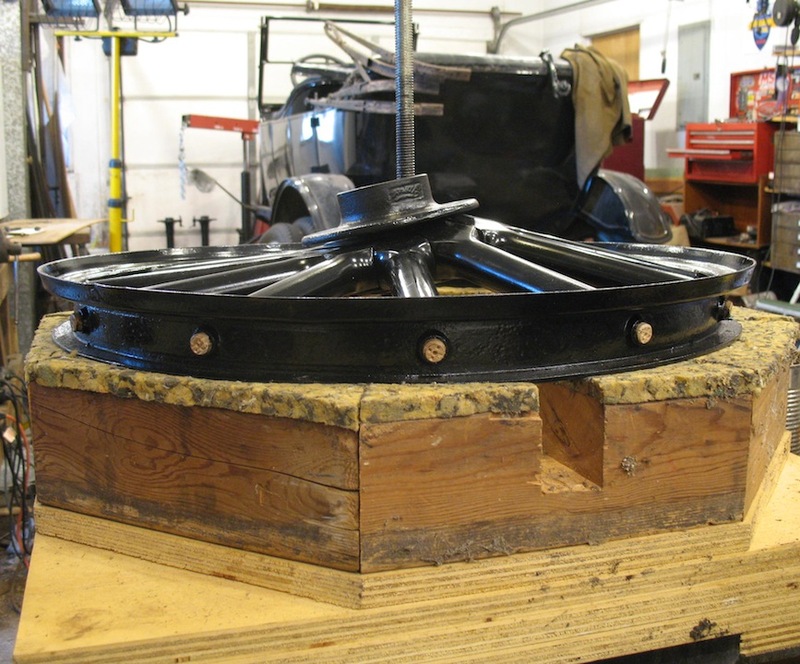 Stephan, the spokes have a chamfer on one side of the base so that they go over the radius on the inside of the hub. Might you have them the wrong way around and the spokes are jamming tight on the hub before the plate is firm? If this is the case the spokes must be turned around in the felloe. Are you sure the back flange of the front hub does not have a lot of runout? I ran into that problem when redoing a set of wheels and found that there was runout on every hub I checked, sometimes a lot. 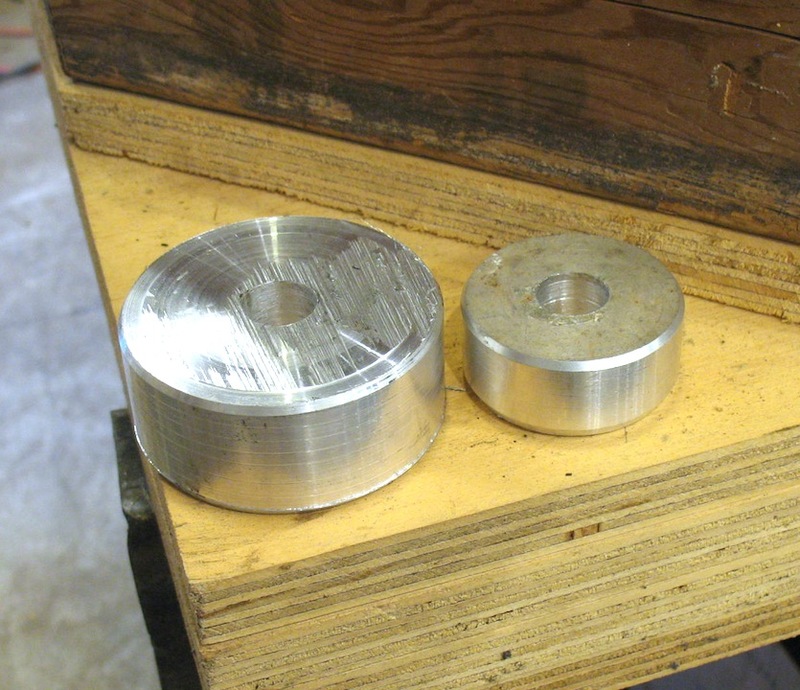 I had to true up the hubs on a lathe to get the wheels to run true. 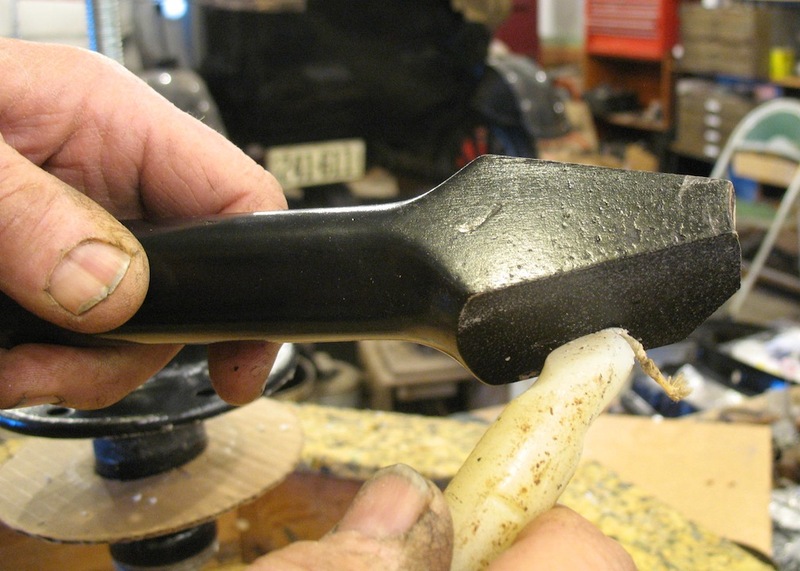 Did you use a spoke press ? You're going to need to start over. Looking closely at the photos it appears to show the spokes are "clocked" a bit. 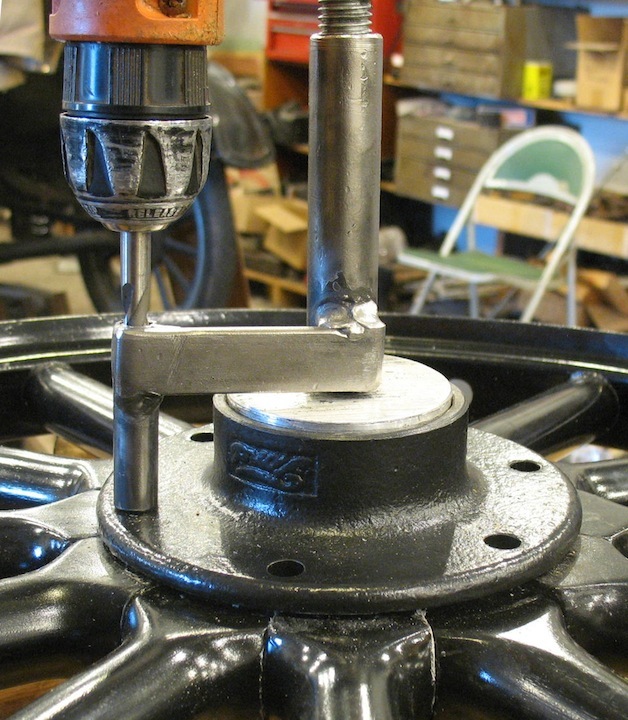 If you examine near the hub, the spokes don't match on their adjoining surfaces, and when put vertical, the upper spoke is not perfectly in line with the lower spoke, through the bearing axis. 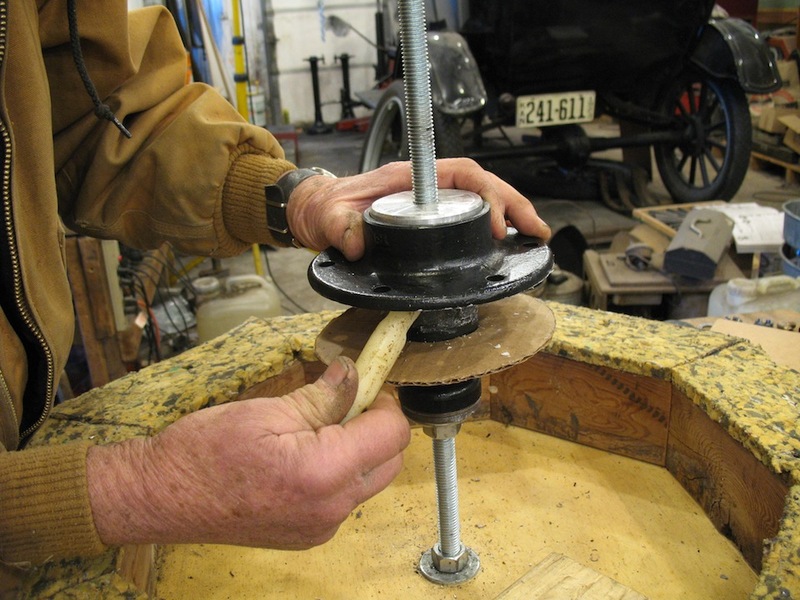 When repressing, rotate the hub by one spoke so that you drill the bolt holes in fresh wood. 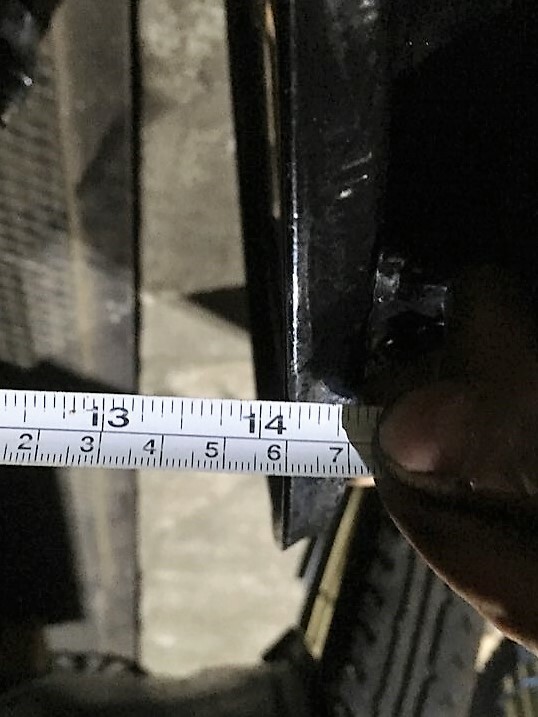 The old holes are going to be misaligned and you don't want to redrill them and lose the rotational stiffness that the bolts provide by going through close fitting holes in the wood. Thanks for your help and all the advice. The outer plate moves over easier now. T much powder painting. I made sure that the spokes are in the correct way in the hub the problem was that some of the spokes were clocked. 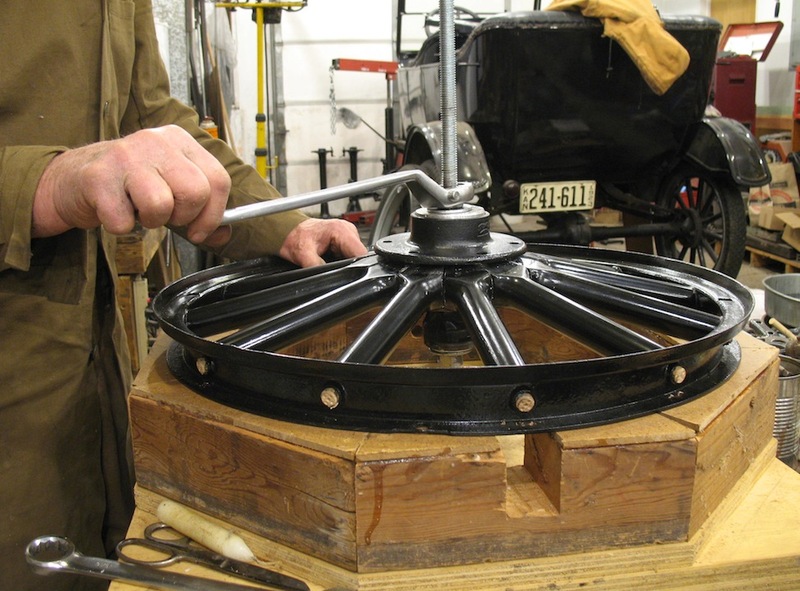 I did use a mix-up of the Regan Spoke press and �Model T Tips, Restoration DVD, Spoke Tightening� it worked perfect for the rear, but I have to say that this hubs were new. Finely I find out that the hub on the photos (right front) has a runout. The cup of the inner moves in the hub. So I am going to change the hub and the bearings. I think than it works. I had taken the left front wheel in parts again and did the hole work again as Scott advice. Finally that wheel moves on the outside just 10mm (0.39�) I think that should work or any advice. I too had no trouble with the rear wheels. But the first time I tried a front wheel the hub went down crooked. So I made these mandrels to keep the hub level. I lubricated the hub and the sides of the spokes with candle wax. The hub stayed level going down. For making the holes I made this jig to keep the drill straight.